Last month we updated all organisation accounts to use our 1.16 release. This release is packed with many features which we explain below. The most obvious change in this release is the new interface for the room. Instead of the dark theme, you'll find the room is much lighter and more consistent with the rest of the pages across the Stickyworld system. As well as the new design, we've made the room and most of the account pages, fully responsive making them much more usable on mobiles and tablets. The about page describes what the room is about and displays useful information about the intended participation in the room. This page is where most visitors will land so it's a great place to explain what it is you want your participants to do. You can display a welcome message and even a video from YouTube, describe your intent or specify the purpose of your room. It's important to complete these as it will help your room participants understand the context. The Slides page is what the room previously displayed by default. It behaves almost exactly the same as before, except the slide gallery is now collapsed by default. 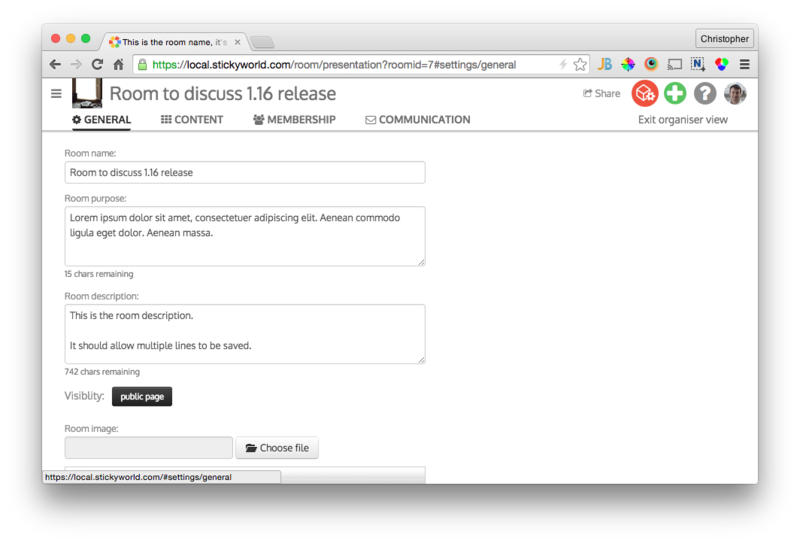 The Comments page is a brand new feature included in this release. 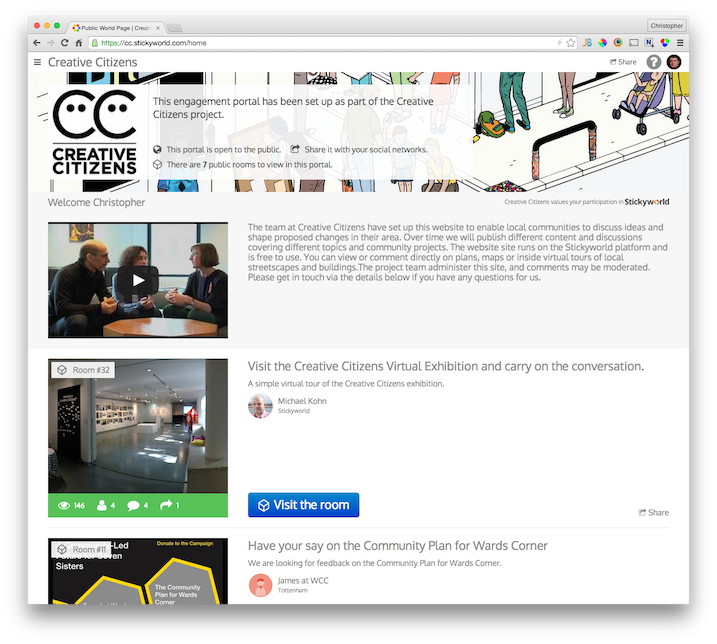 It lists all comments in the room in a responsive grid view. This includes all comments on slides and even general comments. The General page, allows you to change your room name, purpose, description, welcome message. You should try to complete as much of this as possible so that your participants get a good informative experience when visiting your room. The Content page contains what was previously known as Slide manager, you can still drag your slides to re-order them, add slide categories and slides. Selecting a slide from here provides a convenient interface for renaming or deleting slides. The Membership page lists your room Organisers and Participants. You can select someone from this list to see their details and change their role/permissions. 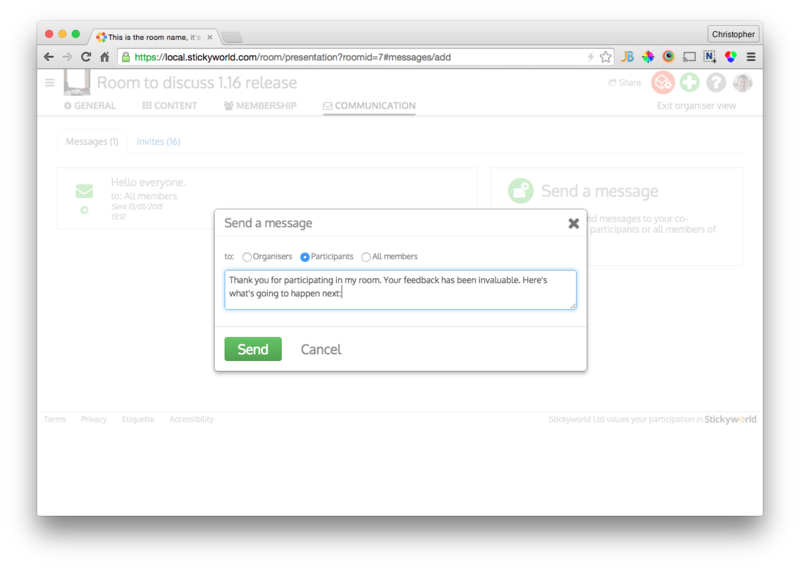 The Communication page lists Messages (a brand new feature described below) and Invites sent. Organisers can communicate with participants, organisers or all members of their room. Messages will be emailed to everyone you specified. We think this is a great way to update your room participants on progress with your project, thank people for participating or any other communication you think will be helpful. You can see all messages that have been sent in the Organiser view under the Communications page. The public world page has a new design, allowing for an optional banner image to be used, we've also listed the public rooms in a visually detailed list view. You can read more about the rooms and view participation stats. 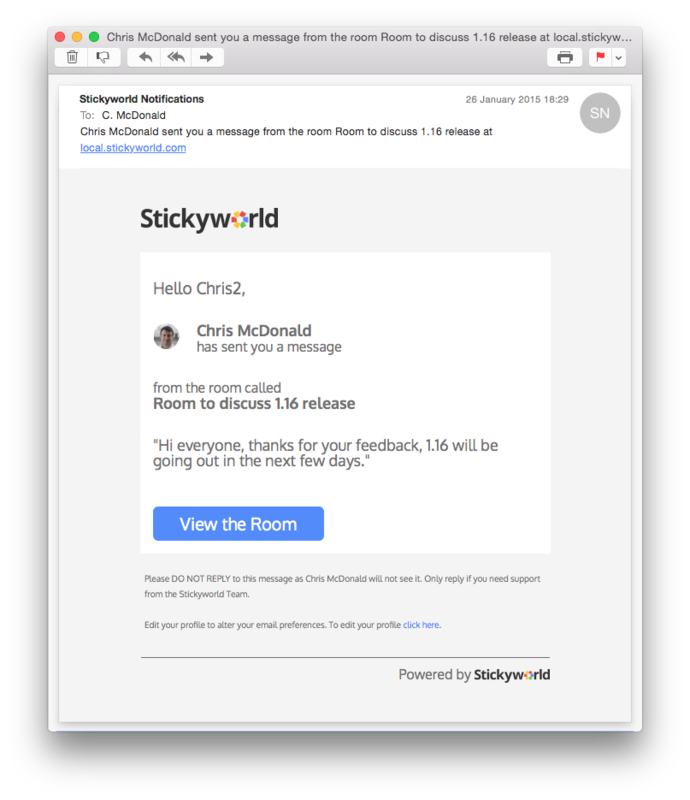 We're always working to improve Stickyworld. The 1.16 release includes a lot of new features, too many to include here. It's been a large update and we hope you enjoy benefiting from these improvements. 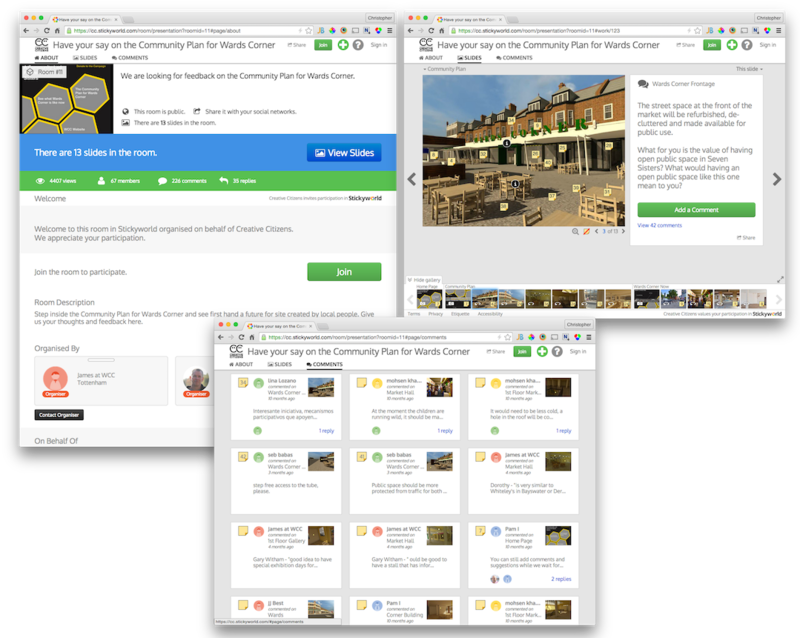 Why not try out some of the new features in your project? Let us know how you get on, we welcome feedback on existing features or ideas for new ones.